A young vervet monkey on the brink of death makes a miraculous recovery thanks to one sanctuary’s fast action. Thanks to the fast and skilled actions of PASA member Colobus Conservation, a young male vervet monkey on the brink of death has made a miraculous recovery and is now integrated into a social group with other rescued monkeys. Likoni’s journey began in July 2018 when Colobus Conservation received an urgent call about a gravely injured young monkey. Suspecting the wounds were inflicted from fighting between vervet monkey troops, a rescue team was sent out to retrieve him. He was found laying curled up, in too much pain to move. His situation was much worse than anticipated. What a transformation! Likoni was left to die after he was brutally attacked with a machete (left image). With the incredible help of Colobus Conservation, Likoni’s life was saved (right image). All evidence suggested Likoni’s wounds were inflicted by humans. Long, deep cuts on his body and head were identical to machete wounds. He was also completely covered in engine oil and dirt. His severe condition and tremendous signs of pain made his survival unlikely. Against the odds, Likoni survived the journey to Colobus Conservation, where vet staff were able to clean and treat his wounds. Likoni then began the long journey of healing, a process that was made as comfortable as possible by the dedicated Colobus Conservation staff. His eyes, swollen shut from injury, eventually opened and his deep lacerations gradually healed. Recovery took months, but today little Likoni has been integrated into a proper social group with other vervet monkeys that will someday be returned to the wild. Colobus Conservation was founded in 1997 to help the increasing number of colobus monkeys being injured and killed along a main road in Diani Beach, Kenya. Today they additionally rescue baboons, vervet monkeys and sykes, offering a 24/7 emergency response team. The monkeys needing care from Colobus Conservation have been injured by a wide-array of threats, including habitat loss, illegal pet trade, electrocution from electrical lines and retaliation from those who view them as pests. To address these threats, Colobus Conservation does public outreach, consultation with local restaurants and hotels that struggle with navigating conflicts between tourists and monkeys. The organization also brings researchers from around the world to study monkey behavior and develop solutions to the ever increasing challenge of humans and monkeys living side-by-side. Their many groundbreaking accomplishments include working with electric companies to make electrical lines safer and creating “Colobus bridges” to allow monkeys a safe way to cross roads. To support Colobus Conservation in their mission to save monkeys like Likoni, please check out PASA’s page where all donations go straight to Colobus Conservation! 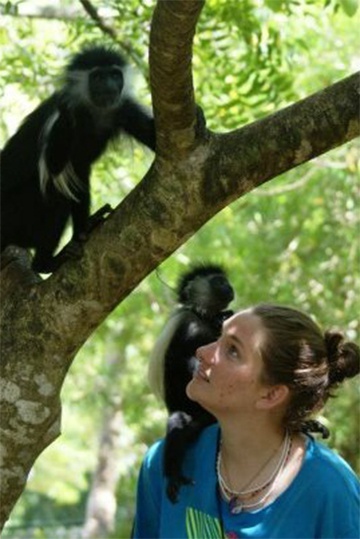 Colobus Conservation provides a safe haven for injured and orphaned primates in Kenya.